The high concentration of sugar in the blood damages the cells of the retina, the part of the eye fundamental for the view, and can cause damage to blood vessels in the eye. Diabetic retinopathy is one of the most common complications and could occur after only 10 years of diabetes. The only way to avoid it is prevention through good glycemic control, periodic eye examinations and antioxidants- based supplementation. 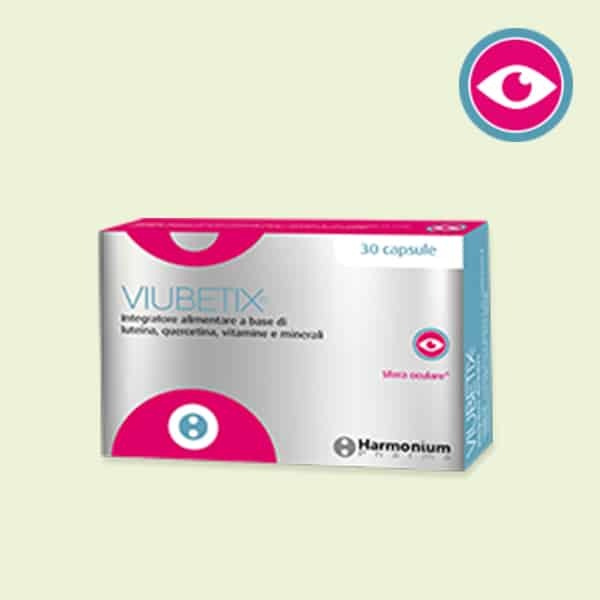 ViuBetix is a food supplement that helps in the prevention of diabetic retinopathy. ViuBetix contains 7 nutrients (vitamins, minerals, antioxidants and others), including lutein and quercetin, useful to protect the visual function due to their effective antioxidant and anti-inflammatory actions. Beneficial effects of the nutritional supplements on the development of diabetic retinopathy. – Kowluru RA1, Zhong Q, Santos JM, Thandampallayam M, Putt D, Gierhart DL., Nutr Metab (Lond). 2014 Jan 30;11(1):8. Neuroprotective effects of lutein in the retina. – Ozawa Y1, Sasaki M, Takahashi N, Kamoshita M, Miyake S, Tsubota K. Curr, Pharm Des. 2012;18(1):51-6. Quercetin inhibits choroidal and retinal angiogenesis in vitro – Yi Chen & Xiao-xin Li & Nian-zeng Xing & Xiao-guang Cao, Graefes Arch Clin Exp Ophthalmol (2008) 246:373–378. Vitamin A derivatives as treatment options for retinal degenerative diseases. – Perusek L1, Maeda T. Nutrients. 2013 Jul 12;5(7):2646-66. Flavonoids protect human retinal pigment epithelial cells from oxidative-stress-induced death. – Hanneken A., Lin FF, Johnson J, Maher P. Invest Ophthalmol Vis Sci. 2006 Jul;47(7):3164-77. Zinc supplementation might potentiate the effect of vitamin A in restoring night vision in pregnant Nepalese women. – Christian P., Khatry SK, Yamini S, Stallings R, LeClerq SC, Shrestha SR, Pradhan EK, West KP Jr. Am J Clin Nutr. 2001 Jun;73(6):1045-51.